Shocking Viewers With His Shaggy Hair And Beard, The ‘Cooler Than Me’ Hitmaker Is Also Roasted For His Performance At The Thanksgiving Game Between The Chicago Bears And Detroit Lions. Mike Posner has left many baffled with his new look. On Thursday, November 22, the “I Took a Pill in Ibiza” hitmaker returned to his hometown, Detroit, to perform at the halftime show of the Thanksgiving Day game between the Chicago Bears and Detroit Lions, and got roasted for looking different. Debuting shaggy brown hair and scruffy beard as opposed to his past buzz cut, the 30-year-old was met with an uproar on Twitter. One user likened him to painter Bob Ross, “Yo why Mike Posner out here at halftime looking like Bob Ross?” Another joked that he looked like a caveman from GEICO commercials. Michael Posner looks like the mud from the sixth sense all grown up. 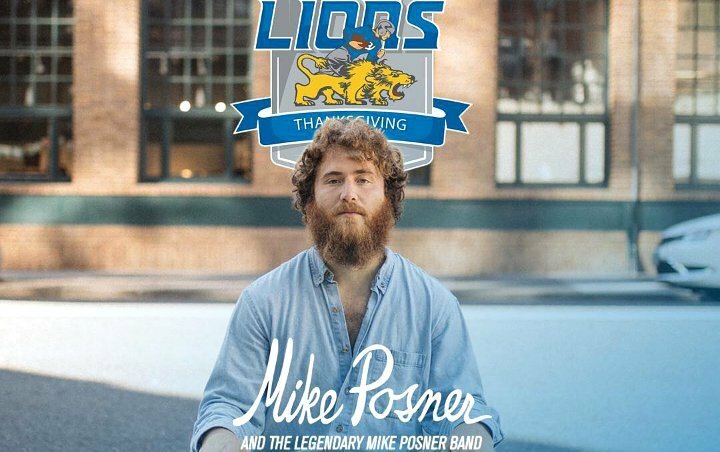 Michael Posner and the “legendary” Michael Posner Band at Lions-Bears halftime show. Who the hell is Michael Posner?? One user, in particular, called out NFL and Detroit Lions for their choice of halftime performer. “What is @NFL @Lions & @NFLonCBS thinking with this halftime noise? The legendary who? Michael Posner? Come on #Detroit! #KidRock #BobSeger #Eminem or a MoTown act are your legends…not this ‘poser,’ ” @DSHEAVALHALLA sneered. What is @NFL @Lions & @NFLonCBS thinking with this halftime noise? The legendary who? Michael Posner? Come on #Detroit! #KidRock #BobSeger #Eminem or a MoTown act are your legends…not this “poser”. So far, Posner hadn’t reacted to the backlash. He did, however, post a tweet on the same day to promote his upcoming album, “A Real Good Kid”, that is expected to be released on January 18, 2019. Unlike his halftime performance, his new release announcement garnered mostly support from his followers with many expressing their excitement. A Real Good Kid. The new album. Jan 18th. Pre-order link in bio.